The invention of the tank was one of the great dramas of the First World War. It was a new concept using old ideas, created in a time of urgent need as a response to the stalemate that trench warfare had created. Constructed at breakneck speed and rolled straight off the production line to be shipped into active service, the first tanks were soon patrolling the mud of the Western Front and the sands of the Middle East. 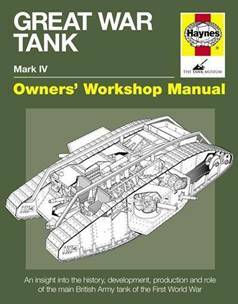 In the Haynes Great War Tank Manual, world authority David Fletcher MBE strips bare the most numerous model, the Mark IV tank to give a rare insight into the maintenance and restoration of these historic armoured fighting machines. Using the renowned Haynes manual format that has successfully given insights into an array of military hardware, he also draws attention to how these menacing spectacles came of age and began to dominate battles as decisive instruments of war. The manual draws upon the rich resources of the Tank Museum’s collections, rare contemporary eyewitness descriptions and surviving examples of the Mark IV worldwide. A wealth of archive and specially commissioned photographs, together with many rare and never-before-published constructors’ drawings, combine with David’s authoritative text to tell the machine’s story from birth to becoming the first-ever successful mass-produced tank. Author David Fletcher describes the tank’s anatomy, construction and armament, and demonstrates how the Mark IV was driven and operated in combat. Included in the manual are the compelling stories of five surviving preserved Mark IVs – Flirt II, the Ashford Tank, Lodestar III, Excellent and Deborah and information on their maintenance and restoration. The book is a joint publication with the Tank Museum in Bovington in Dorset where until recently David worked as a historian.